(186 x 255 mm) 8.3 x 11.7 in. (186 x 255 mm) 11 x 14 in. A3 Size 10 x 14.7 in. THANGKA 14.9 x 23.3 in. (378 x 595 mm) 14.9 x 23.3 in. 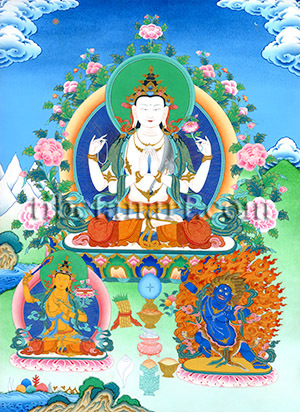 NOTE: The original unbrocaded thangka of this unique composition by Sunlal is for sale. Priced at GBP £850.00. Rigsum Gonpo, meaning the "Lords of the Three Families", refers to the enlightened deity trinity of Avalokiteshvara, Manjushri and Vajrapani, who symbolically represent the body, speech and mind aspects of the buddhas of all times -past, present, and future. Songtsen Gampo, the first of the three great Tibetan Buddhist Kings, is said to have constructed four directional temples dedicated to this auspicious trinity around the Jokhang Temple in Lhasa. Respectively these three ‘Enlightened Families’ are known as the Padma or 'Lotus family', the Tathagata or 'Buddha Family’, and the Vajra or ‘Adamantine Family’. Avalokiteshvara is the presiding 'Lord of the Lotus Family', who embodies the ability to transmute desire or craving into compassion. Manjushri, as 'Lord of the Buddha Family', transmutes ignorance into wisdom or pristine awareness. And Vajrapani, as 'Lord of the Vajra Family', transmutes hatred and aggression into power and energy. Avalokiteshvara (Tib. Chenrezig; spyan-ras gzigs), the "All-Seeing Lord", is the embodiment and bodhisattva of compassion, who is invoked through his well-know six syllable mantra, OM MANI PADME HUM. He is peaceful, youthful and radiant white in colour, with a sweetly smiling face, two eyes and four arms; with his four arms represent the "Four Immeasurables" of his loving kindness, compassion, sympathetic joy, and perfect equanimity. He sits in vajra-posture upon a white moon disc and multi-coloured lotus, with a display of flowers, buds and leaves encircling his radiant aura. He wears the five silk garments and eight jewel ornaments of a sambhoghakaya deity, and his characteristic emblem of a deer-skin is draped over his left shoulder and breast. With his first two hands forming the anjali-mudra in front of his heart he cups a blue wish-granting gem, symbolizing the compassion of all buddhas. With his second right hand he holds aloft a crystal or pearl rosary of 108 beads, representing his ability to guide all beings on the path to liberation. And with his second left hand he holds aloft the stem of an immaculate pinkish-white lotus, indicating that he is untainted by the defects of cyclic existence. Manjushri (Tib. Jampa; jam-dpal), the "Gentle-voiced", is orange or red-yellow in complexion, with two eyes and two arms. He is peaceful and youthful like a twelve-year-old prince, with a sweetly smiling face, and is likewise adorned with the five divine silk garments and eight jewel ornaments of a sambhoghakaya deity. His long sapphire-black hair is described as being piled up into five topknots, and to indicate the five types of wisdom he also wears a five-jeweled crown. He sits in vajra-posture upon a white moon disc and pink lotus, and with his right hand he holds aloft his fiery, sharp wisdom-sword that cuts through all obscurations. With his left hand he holds the stem of an immaculate lotus that supports a text on the "Perfection of Wisdom" (Skt. Prajnaparamita-sutra) in a hundred thousand stanzas. Vajrapani (Tib. Chagna Dorje; phyag-na rdo-rje), the "Vajra in Hand", is wrathful and blue-black in colour, with two arms, three round red eyes, a gaping mouth with bared fangs, tawny upward-streaming hair, and the corpulent and powerful body of a yaksha spirit. With his right leg bent and left leg extended he stands in pratyalidha posture upon a golden sun disc and a lotus amidst a blazing mass of awareness fire. He wears a green silk scarf that billows around his body, a tiger-skin loincloth, a five-jewel crown, and both gold and bone ornaments. With his raised right hand he holds a golden five-pointed vajra, and with his left hand held in front of his heart he makes the threatening tarjani or raised forefinger gesture. The assembled offerings below Avalokiteshvara depict the "Eight Auspicious Substances" or ‘bringers of good fortune'. These consist of: 1. A Mirror, shown as a bluish-silver oval on a golden stand. 2. Precious Medicine, shown below as orange bezoars in a golden bowl. 3. Durva Grass, shown as a silk-tied bundle of five stems. 4. Precious Fruit, shown as a stem bearing three fruits with leaves. 5. Curd, shown as white waves of yogurt in an ornate pot. 6. A White Conch, which turns or spirals to the right. 7. Mustard Seed, shown in the square turquoise container at the bottom centre. 8. Vermilion Powder, shown in a golden bowl.